*. Why a world of hearts? *. How did you invent the HeartMark? As a child, I loved hearts. I was determined to draw or cut as many hearts as there are people in the world even though I knew that it is pretty impossible as there are so many people. Nevertheless, I could cut or draw hundreds of hearts in a short amount of time. I also knew how to make a heart with my hands. I loved playing with my hands, in bed at night, to make different designs and I mainly made the heart. But I didn’t show it to people. I just liked to do it. 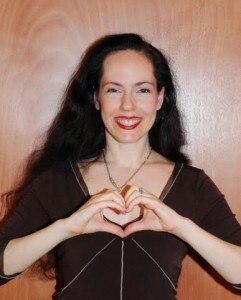 As I grew up, I didn’t do the HeartMark with my hands at all, but I still knew it is possible. In the meantime, I kept watching different inventions of mine get made by others. The one thing no one had made was a world made of hearts. In college, I sat down to put this world on paper. I practiced methodically every orientation of heart for the nose, then eyes, then mouth, then cheeks… Like a scientist that names every species, I grouped and categorized every option. Finally, I finished studying different heartfaces. It was time to create the heart bodies. I chose my favorite “basic” heart face for a main character to work off of to draw the body. Then I drew my first heart “body.” It needed hands. The minute I had to figure out what to do with the hands, I remembered my HeartMark. I had not named the position yet. I tested it with my fingers, looked at them, and then drew the HeartMark. Then I thought about it. It was perfect. It symbolized everything that I could want. I wrote, The Power Is Inside You!” next to my main character. This became my character’s goal–to inspire others that the power is inside them. This was in 1996. I went on to write and think about the main character, the HeartMark, and what it means to be empowered for a long time after that! *. Why did you name the HeartMark by this name? I knew it was different from a heart. I felt that I discovered something novel. A heart is whole. This was a heart that was created by more than one piece coming together. It was a whole new concept. No one had ever broken up the heart before. I even had an agent comment in a judgement–the heart is “missing” half of itself– it’s lacking… ! True, partially. The heart longs to be whole. But by opening itself, it can make new attachments with others. This is so symbol. I could go on and on about the symbolism of the HeartMark. At the time that I chose the name HeartMark, there was barely an internet. All the domains were available, including the heartmark, 88, and many others that I wanted to buy. But it was still very expensive to buy a single web address–$75. I did a trademark search. I still have the computer’s results on it! There was nothing close to HeartMark. I debated a lot (with myself) and finally decided to just stick with that name. Through the years, I have asked others’ opinions, and no one had a better name, so this stayed. *. How did you name the main character Lovelle? I chose to participate in a leadership training seminar, level 3 I think, because I knew it required that we put on a project that benefits the community. I already had the project in mind. So I just wanted a space that would guide me with the right tools. My project was to start a magazine for teens that I called “Choice.” I wanted it to have real articles. I wanted it to sound familiar–with photos of school sports teams that someone might hope to identify with. I wanted teens to find advice on life and voice their opinions. All the other ‘zines had make up advice, ads, and pop culture. ‘Zines about tv stars don’t have useful advice about social norms, guys, friendships, school, and parents. So anyway, while participating in this leadership training, a very inspiring man who had been born addicted to drugs was there to inspire me. He was no longer addicted to anything. He was respectful and amazing. Everyone loved him. I must have complimented him a zillion times and he never mistook my compliments for flirting (which I wouldn’t have wanted him to mistake, but some guys would have by then.) His name was Lovelle Williams. I already had Planet Heart partially planned. I already knew what Lovelle would look like. I just didn’t have Lovelle’s name, until I met Lovelle Williams. Who kept a garden in a small street in the heart of San Francisco. So my Lovelle became a gardener on Planet Heart. And this couldn’t have been more perfect, because I grew up among plants, …quite free to roam around outside as a child. *What else does the HeartMark symbolize? I could fill up books on this. Once I saw that one character can make join two hands to make a heart, I immdiately realized all the characters should express “hello, peace, love, and appreciation” in this manner. The HeartMark was both a personal gesture, for one to affirm oneself, and a public gesture, to affirm others. It became a way to send out love, and to channel in positive energy as well. The HeartMark, in the early years, was made by hands shaped like half hearts, so it was hollow. This hollowness allowed for the energy to flow. After a few years, I realized that the heart can be chopped in a variety of directions, and by more than just two pieces (around 2004). The value in the HeartMark is that love is created by more than one piece. Love should be a result of more than one force joining together. It is about harmony. The whole heart is a beautiful symbol of many coming together in harmony. *. What is so special about Lovelle’s design? I have created many characters that are truly heart shaped. But Lovelle is the first character that I drew. At the time, I was full of insecurities about my ability as an artist. I was also left-brained, at least half the time! I analyzed and judged everything. I heard my parents’ voices quite a lot when I drew. I heard in my head my mom saying that the character doesn’t look realistic enough. I think it’s something she would have said. In my imagination, she said the character looks immature, which would make people think I am immature. I heard her say the character is not symmetrical. …big one. I had to deal with that one. I am not symmetrical. But my instinct has always been to affirm every such criticism. So the instant some part of me judged Lovelle as being imperfect, another part of me had the “perfect” comeback– Lovelle is perfect! Lovelle is all heart! Lovelle is pretty on the inside and this shines out. Who cares if the hips are not the same height… Which is actually a reflection of most girls in real life–we are always afraid of little physical imperfections. No one who sees us cares about these subtle imperfections. In fact, everyone that sees the original Lovelle still thinks Lovelle is beautiful. No one has ever complained of Lovelle’s “imperfections.” When we draw, we see every line we meant to draw differenrtly. But when others observe art that they didn’t create, they look at the overall effect. The same is true about human beings. When others look at us–they see our smile and our good intentions. They don’t see if our hair is out of place. This is just one example of how I used Lovelle to understand and empower myself and others. I did the same scrutinizing, judgement, followed by affirmation, for every detail on Lovelle. I learned a lot about art and myself as a result. In the end, Lovelle’s HeartMark says it all– I am at peace with myself, and I send peace towards others. I wrote hundreds of poems, stories, and “affirmations of the self” in many series and in many formats. All star this first Lovelle, making the HeartMark. Everything on the news: negative & positive. Negative news inspire me to get up and make my world a Planet Heart as soon as possible… The desire to make the world safe just gets refreshed each time. It is the desire to have some choice and control where I can—over my actions. One unexpected side effect of all this: the ability to express myself (through the Heart Characters who live by good values)—totally a consequence of wanting to be an example. I did not set out to express myself or preach, but I like that I can show a good example of behavior that works. It is better than watching examples of behavior that does not work and feeling helpless against it. *. What are you most fortunate about? *. Whom would you want to thank first? Parents, places & teachers who educated me: Israel, US, Ms. Harper (Junior High), Mrs. Bloom (Junior High), Dr. Serfaty (high school). –I wrote this over a decade ago. I would also like to thank my hubby and ever friend and random acquaintance whom I met since I was born—anyone who smiled at me. I had a very wonderful childhood. I feel very fortunate for that. I feel responsible to pass on the goodness. The HeartMark is just one gift to the world, to allow everyone to express love, and to spread “love between the spaces.”(TM) I have had so many dreams in which I teach people how to fly by making them feel confident and at peace with themselves. The HeartMark and Planet Heart is about teaching people true acceptance. Everyone has great intentions, everyone is doing their best, everyone is beautiful inside and out.